“It was in 1738 in a prayer meeting at Aldersgate Street, London, that John Wesley felt ‘that his heart was strangely warmed’ and that he did trust in Christ for salvation. For the first time he had a feeling of certainty that his sins were forgiven. Since that day Methodists have called that event a heartwarming experience.” We hope that all persons who come to worship at Aldersgate Church will likewise experience the trust and assurance of God in Christ. The Rev. 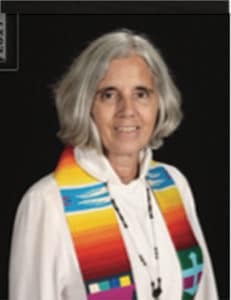 Anne O’Connor, with her husband Tom and daughters Megan and Katie, was called from Walworth & West Walworth United Methodist Churches to the ministry at Aldersgate beginning July 1, 2001. Because of the need for more room for every aspect of church life, from worship to group activities to storage, plans for church expansion were begun. A building committee was formed, an architectural firm selected to draw up a master plan, and Capital Campaign consultants chosen. In July 2004 the church voted to proceed with the building plans. The congregation, with pastoral leadership, undertook the study and discussion of the book, The Purpose-Driven Life by Rick Warren, used in Sunday morning worship and small groups. The next year, to help in understanding the roots of our faith, a study of the Old Testament was begun. These studies increased participation in the many small groups. New groups have also been added, including the Saturday morning AMEN group for men, a grief recovery group, and a Reading Circle. The White Gifts and Angel tree program remain strong. In 2002 a new pictorial directory was printed. Aldersgate hired its first full-time youth pastor, Timm Sacrey, who arrived with his wife Sandy and two small children from Brampton, Ontario, Canada. The youth have been active in the Flower City Work Camp during their spring break, as well as other mission trips. They have also served several dinners for the church. New choir robes were purchased and dedicated to the memory of loved ones. A new, more up-to-date sign was installed in front of the church, and a video projection system was purchased for use in the sanctuary. In August, 1997, Rev. Gerald (Jerry) Wolter and his wife Helen were called out of retirement from Wesley United Methodist Church to serve on the staff at Aldersgate as Pastor of Visitation and Membership Care. He offers much loving care and support for the sick, those having surgery, and those grieving the loss of a loved one, as well as assisting in worship services. While at Aldersgate, he preached his 3000th sermon. Rev. William Burdick, with his wife Sue and their two children, Joseph and Natasha, began his ministry at Aldersgate on July 1, 1994. They came from Akron First United Methodist Church, and moved into a newly refurbished parsonage. Bill’s motorcycle was his favorite mode of transportation. After much discussion, Aldersgate went back to holding two worship services on Sunday morning, an early contemporary service and a later traditional service, with Sunday School in between. On Sunday mornings in the summer, when the weather was pleasant, the earlier service was held outdoors by the garden. Several unique services were held, including a Mardi Gras Sunday worship with Dixieland music by the “Sanctuary Saints”, a pottery-making demonstration, and outdoor tent services with Blue Grass music and homemade ice cream. The church celebrated the 40th anniversary of its founding with a special service followed by a dinner at Logan’s Party House. Guests included Mr. and Mrs. Thomas Morin, Rev. Philip Schlick, Rev. and Mrs. John Brewster, Rev. and Mrs. John Cooke, and District Superintendent Rev. and Mrs. David Lubba. Eighteen charter members in attendance were honored. Disciple I Classes continued, and the Body Builders program began with four small discussion groups. Vacation Bible School was held each summer, and participation in adult Sunday School grew. The Youth Group went on several mission trips, including a trip to Iowa to help rebuild after the flooding in the spring of 1994, and later to Ohio and an Appalachian area south of Pittsburgh PA. The youth began holding early morning weekly prayer breakfasts following the tragedies of 9/11. The Actors’ Guild was formed, putting on a Christmas Dinner Theater and enhancing many worship services with short skits. Many from our congregation, cooperating with others in the area, became involved with building Habitat for Humanity houses in the city. Support for the White Gifts program continued, and participation in the Angel Tree, providing Christmas gifts for children of incarcerated persons, was enthusiastic. Realizing the need to update the church’s facilities and provide the congregation with a warmer, more comfortable and welcoming place to worship, the Sanctuary Refurbishment Committee began making plans with the aid of an interior decorator. Work began in summer 1997 and was completed two years later. Changes included painting and new carpeting throughout the sanctuary and hallway; chancel woodworking was reconfigured, pews refinished and upholstered, and door windows etched. Two memorial stained glass windows were installed in the sanctuary over the choir loft, and a digital piano for the sanctuary was purchased. To complete the redecorating, both Fellowship Hall and the parlor were repainted, and new window treatments and flooring were installed. To allow flexibility for future possible expansion needs, the house and property north of church was purchased, upgraded, and used for rental. Bill was hospitalized in mid-spring of 2001 with a serious illness, and retired that June as previously planned. The congregation joined with him to celebrate his retirement in September after his recovery. The Rev. John Cooke, with his wife Charlotte and their three children, Beth, Amy, and David, was appointed to Aldersgate from Epworth Christ United Methodist Church in Jamestown NY. He served our congregation for thirteen years, from July 1981 through June 1994. Among other attributes, he brought with him a great love for music, and talent for singing and playing piano, as well as his gifts of encouragement and humility. While at Aldersgate, John received his Doctorate of Ministry degree from Drew University. These were exciting years, both for the Methodist Church at large and for the growing congregation at Aldersgate. Many participated in Camp Meeting ’84 at the Carrier Dome in Syracuse NY, celebrating the 200th birthday of the Methodist Church, and later in the Billy Graham Crusade, held locally at Silver Stadium in 1988. As a result of the Crusade, a Thursday evening prayer service was begun, attempting to provide a time for worship for those who could not attend on Sunday morning. To enhance worship, a new Allen digital computer organ was purchased in 1985, and later, new hymnals were dedicated. There was a concern that the church appeared to shut down in summer, so in 1990 a second summer worship service was added. Then to serve a growing congregation during the regular year’s schedule, a new contemporary worship service with praise music was added to the two other traditional services, one with music by soloists, and the other with music by the choir. New Disciple Bible Study classes brought to many a deeper understanding of scripture. In the field of missions, Aldersgate sponsored refugees from Ethiopia and Cambodia. Among the activities of the Youth Group was a mission trip to Dominican Republic; and for fellowship among older adults a “Fifties Plus” Group was formed. Several Watson Winter Weekend retreats were held; and the Evening Women’s Circle began again. During these years, three pictorial directories were produced. Partly because of John and Char’s involvement with United Marriage Encounter, a Christian-based program to help make good marriages better, many Aldersgate couples also became involved. Staff positions of Christian Education Director and Youth Director were added to help enhance the Christian Education program. Improvements to church facilities included the much-needed addition of the handicap entrance and parking area, room dividers in Fellowship Hall for better Sunday School usage, a new sound system for the sanctuary, and a new roof and siding on the parsonage. Dr. Cooke was appointed to Baker Memorial United Methodist Church in East Aurora NY in June 1994. In June of 1976, Rev. John Brewster and his wife Gerry came to Aldersgate from Orchard Park United Methodist Church. They had two daughters, Linda and Janice. Jack had a twin brother, who was also in the ministry. His ability to draw clever caricatures of people and places is well-remembered. During his tenure the Administrative Board set up the Good Samaritan Fund, a discretionary fund to be used as needs arose. Each year many attended a church camp at Camp Asbury in Silver Lake. Many programs, begun in earlier years, continued on, such as the Arts and Crafts Show and Sale and the White Gifts program. The eternal light was placed in the chancel in recognition and memory of the founder of Aldersgate, Rev. Rowsam. Among other memorial gifts at this time was the carillon to play chimes inside and outside the church, a Public Address system for the sanctuary, new lights in the sanctuary and hall, and tables and chairs for the church library of 2,000 books. In 1980 Aldersgate celebrated its 25th anniversary with a special service on the church lawn attended by over 200 people. This was followed by a banquet at the Lake Shore Country Club, enjoyed by 160 people of whom 46 were charter members. Special guests were Rev. and Mrs. Barnard Howe, Rev. and Mrs. Philip Schlick, Mr. and Mrs. Thomas Morin (formerly June Rowsam). A taped message from Rev. and Mrs. Reginald Cory was played. Rev. Brewster left Aldersgate in 1981 to become District Superintendent of the Batavia District. The Rev. Philip Schlick, his wife Marian, and their three children, David, Margaret, and Robert, came to Aldersgate from Falconer First United Methodist Church in June 1970. Early in his pastorate, the church celebrated Debt Free Day, when $250,000 indebtedness on the educational wing was paid off. Later our parking lot was paved, and pews were dedicated in memory of our first pastor and many others. As a result of the union between the Methodist and Evangelical United Brethren Churches, the Women’s Society of Christian Service became the United Methodist Women. They held their first Arts and Crafts Show and Sale, an annual event still being held 30 years later. The White Gifts Program began at this time, serving two families with food and gifts the first year, and increasing the number of families served each year thereafter to at least as many as thirty. Christmas of 1972 was made more memorable by the huge Christmas tree nearly filling the chancel, decorated with chrismons (white monograms) made by the Sunday School and church families. Acknowledging our nation’s bi-centennial year, Aldersgate celebrated Heritage Day and entered a float in the Greece Bi-centennial Parade. A second pictorial directory was printed. The youth of the church put on youth worship services, and also went on a mission trip to Missouri, earning money with car washes, spaghetti dinners, etc. Rev. Schlick left Aldersgate in June 1976 for an appointment to the United Methodist Churches in Kennedy NY and Ellington NY; and then retired in 1978. The Rev. Barnard Howe was appointed to Aldersgate in June 1966. He came to us from Hurlbut Memorial Church at Chautauqua NY, and, with his wife Kaye, moved into our new parsonage on Summit Hill Drive. They had three daughters. Rev. Howe preferred to be called “Mr. Howe” or “Barney”. He was a very innovative pastor with his unique style of introducing new ideas and programs. He put a lot of emphasis on Family, Children, and Youth programs, including a new youth choir of about 17 young people. There were youth mission trips to New York City and West Virginia, family night dinners, a summer worship service in Hamlin Beach Park followed by an all-church picnic, and family weekends at Watson Homestead with singing, games, and nature walks led by Barney himself. One summer the Howes extended an invitation to visit their camp at Chautauqua; those who went set up tents on the Howes’ lawn and attended Sunday worship services at the Methodist House at Chautauqua Institute. During Barney’s time with Aldersgate, we purchased new hymnals, lighting for the cross window, and flags for the sanctuary. A Memorial Book was dedicated and a “Friends of the Library” group was formed. We made our first pictorial directory at this time. A very meaningful women’s Meal in the Upper Room was held in the sanctuary, with tables arranged in the shape of a cross and with an empty chair at the head for Jesus. Special foods were eaten by candlelight in silence except for the reading of selected scripture passages. Following a Uniting Conference at Dallas TX, the Methodist and Evangelical United Brethren Churches merged to become the United Methodist Church. The Rev. Barnard Howe left Aldersgate in 1970 to serve in Falconer First United Methodist Church. In June 1962, Aldersgate welcomed the Rev. Reginald Cory and his wife, Dema, from Medina Methodist Church. Their two daughters were grown, on their own and pursuing their careers. Rev. Cory had been a chaplain in the military, which had provided him with a unique understanding of his parishioners and others. He was a regular visitor to many of our homes, his warmth and personality presenting a “father figure” to some. Dema Cory became very active in many areas, especially the Women’s Society of Christian Service, which provided furnishings for the parlor during this time. Rev. Cory played the piano and enjoyed singing the Sunday hymns with enthusiasm. This love of music influenced the eventual gifts of two new pianos and a new Baldwin organ. Among other memorials at this time, a new brass cross for our altar was dedicated. A new women’s choir with ten members was formed. During Rev. Cory’s tenure, there was considerable emphasis on the use of visual aids. A filmstrip projector was donated and a 16mm sound projector purchased. The Sunday School continued to grow and by 1964 there were over 300 children enrolled. In 1966 the church celebrated its 10th anniversary with the dedication of the stained glass cross window designed by Robert Gabel, one of our charter members. Bishop Ward preached at the service, and a dinner was served in our fellowship hall that evening. Rev. Reginald Cory retired in June 1966. After determining in the late 1940’s that there was a need for a church to serve “the growing edge of Greece,” plans were made to begin the task of developing the first new congregation in the Rochester District in 25 years. To this end the Reverend Mr. Robert H. Rowsam was appointed in May 1955, at the same time serving Adams Basin Methodist Church. He moved into the Adam’s Basin parsonage with his wife June and their son, Scott. Another son, Dean, was born in 1959. A young and very energetic pastor, Bob Rowsam began gathering a congregation by making house to house visits in the neighborhood of the new church property on Dewey Avenue. The first jobs to be undertaken were choosing a name for the church – “Aldersgate” after John Wesley’s heartwarming experience – and finding a temporary place for worship on Sunday mornings – Britton Road School. The first worship service was held on Sunday, September 18, 1955, with 79 people in attendance; a groundbreaking service was held that afternoon on the new church site. The first group of charter members, 103 in all, was received by Bishop Ledden on January 29, 1956, at Britton Road School. Sixty-six others, who were received as members during that first year, are also considered charter members. Among the “firsts” for the new congregation were the first baptism in October 1955, the first Youth Fellowship meeting, and a caroling party in December, first chancel choir appearance on Palm Sunday, and first primary and junior choirs. Family night suppers and an all-church picnic were held. The Women’s Society of Christian Service and the Methodist Men were both organized in 1956. The 52nd service of worship, September 9, 1956, was held in the new church building, preceded by an all night prayer vigil. The new congregation continued to grow so rapidly that by Thanksgiving two services were held: 9:00 and 11:00 with church school at 10:00. These were the baby boom years and on most Sundays there was at least one red rose on the altar, sometimes more, to celebrate the birth of a new baby. The nursery class was the fastest growing group in the church. The Rowsam family moved into the first parsonage on Shorecliff Drive in June 1957; the mortgage for the house was burned less than two years later. The first Confirmation Class was received on Palm Sunday in 1957. Until the educational wing was added in 1960, family dinners, bazaars, and meetings were held in the sanctuary, which meant a lot of setting up and tearing down for each event. Memorials included the pulpit Bible, the first organ, and hymnals. Rev. Rowsam was appointed in 1962 to serve West Avenue Methodist Church. Following his death at age 47 the eternal light, symbolizing the light of Christ and his constant presence, was placed in the sanctuary chancel in his memory. This article was originally published in the “50th Anniversary Celebration Book”. Thanks to Ed and Shirley Geier for providing a copy for the web site.